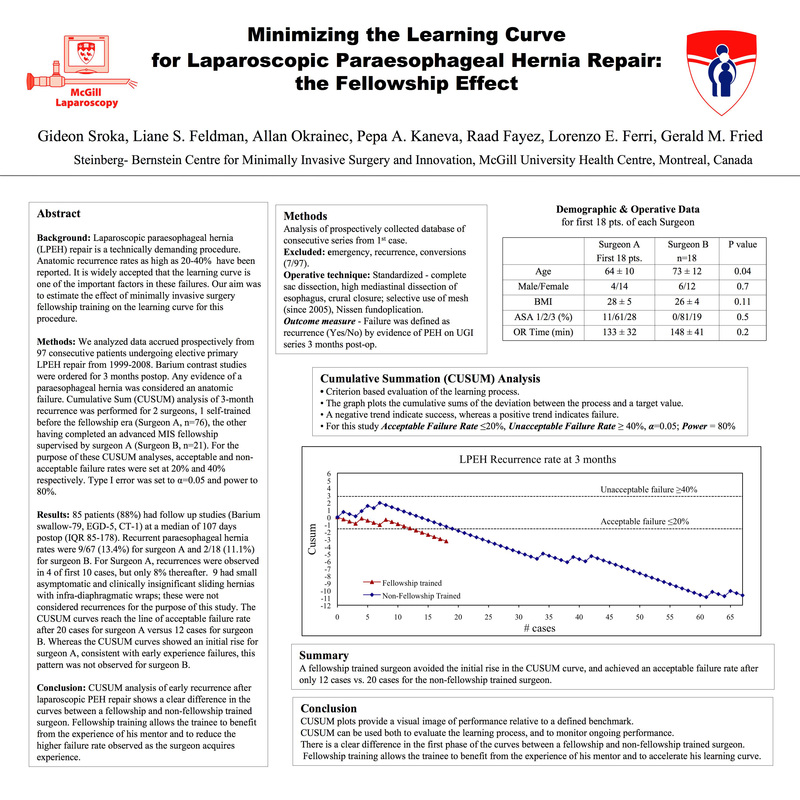 Minimizing the Learning Curve for Laparoscopic Paraesophageal Hernia Repair -the Fellowship Effect. Introduction: Laparoscopic paraesophageal hernia (PEH) repair is technically demanding with anatomic recurrence rates as high as 20-40% reported from leading centers. The learning curve is an important factor in these failures. Our aim was to estimate the effect of MIS fellowship training on the learning curve for this procedure. Methods: We analyzed data accrued prospectively from 92 consecutive patients undergoing elective primary LPEH repair from 1999-2008. Routine barium UGIs were ordered 3-mo postop. Any evidence of a PEH was considered an anatomic failure. Cumulative Sum (CUSUM) analysis of 3-mo recurrence was performed for 2 surgeons, 1 self-trained before the fellowship era (Surgeon A, n=76), the other having completed an advanced MIS fellowship supervised by surgeon A (Surgeon B, n=16). For the purpose of these CUSUM analyses, acceptable and non-acceptable failure rates were set at 20% and 40% respectively. Type I error was set to α=0.05 and power to 80%. Results: 82 patients (89%) had barium studies at a median of 105 days postop (IQR 82-150). Overall failure rates were 8/66 (12.1%) for surgeon A and 2/16 (12.5%) for surgeon B. For Surgeon A, recurrences were observed in 4 of first 10 cases, but only 7% thereafter. The CUSUM curves (see graph) reach the line of “acceptable” failure rate after 20 cases for surgeon A versus 12 cases for surgeon B. Whereas the CUSUM curves showed an initial rise for surgeon A, consistent with early experience failures, this pattern was not observed for surgeon B. The patients were similar in terms of age, ASA, hernia size, operative time, estimated blood loss, and length of stay. Conclusion: CUSUM analysis of early recurrence after laparoscopic PEH repair shows a clear difference in the curves between a fellowship and non-fellowship trained surgeon. Fellowship training allows the trainee to benefit from the experience of his mentor and to reduce the higher failure rate observed as the surgeon acquires experience.